Elfin Photo Editor is an image editor and optimizer for users who want to make their photos stand out. Fast and effective, simple and easy to use. 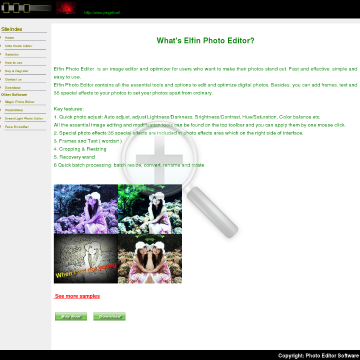 Elfin Photo Editor contains all the essential tools and options to edit and optimize digital photos. Besides, you can add frames, text and 35 special effects to your photos to set your photos apart from ordinary. 1. Quick photo adjust: Auto adjust, adjust Lightness/Darkness, Brightness/Contrast, Hue/Saturation, Color balance etc. All the essential image editing and modification tools can be found on the top toolbar and you can apply them by one mouse click. 2.Special photo effects:35 special effects are included in photo effects area which on the right side of interface.